BattleCry is a FIRST Robotics competition that gives young engineering and robotics enthusiasts an opportunity to compete with their robots in exciting competitions, obtain awards, and hone their technical skills. This is an annual event will be hold on Saturday, June 8, 2018. For more information, please contact the Robotics Engineering Department by email at rbe@wpi.edu. Girls Who Code is a program for girls who are interested in learning about computer science and how to impact their community. This program exposes girls to positive female role models with a background in computer science, from WPI and Dell. For more information, please contact the Office of Pre-collegiate Outreach Programs by email at pop@wpi.edu or by phone at 508-831-4900. *Note: There are no parent opening or closing sessions. If WPI or Worcester Public Schools are canceled due to inclement weather, this program will also be canceled. There are no make-up days for snow days. A snack will be provided for each student, but if you choose to bring your own, it must be nut free. WPI is pleased to host appropriately chaperoned high school groups on our campus throughout the year. Visits typically include a 60-minute presentation that provides an overview of WPI and the admissions process, as well as a 60-minute campus tour. For available dates, times, and to inquire about bringing a high school group to visit WPI, please contact Undergraduate Admissions at by email at admissions@wpi.edu or by phone at 508-831-5286. Invitational Math Meet enables students compete for WPI scholarship money (as individuals and teams) by answering challenging questions in secondary-level pre-calculus mathematics. This is an annual event held in October. For more information, please contact Rhonda Podell in the Mathematical Sciences Department by email at rpodell@wpi.edu or by phone at 508-831-5241. Savage Soccer, a VEX Robotics program, challenges students to design and build radio-controlled and autonomous robots that compete against other robots. This is an annual event held in October. For more information, please email at savage@wpi.edu. TouchTomorrow is a family-friendly festival of hands-on technology and exhibits for all ages. This is an annual event will be held on Saturday, June 8, 2019. For more information, please email at ttreg@wpi.edu. The Water Rocket Competition is an annual event through the Department of Physics that invites all schools in Worcester County to send teams of students to participate. This program takes place in early June each year. For more information, please contact the Physics Department at physics@wpi.edu or by phone at 508-831-5886. The Women's Research And Mentorship Program is for girls who are interested in learning about STEM research alongside a WPI undergraduate and graduate student. This program exposes young women to positive female role models with a STEM background who are pursuing an undergraduate, masters, doctorate, or post-doctoral degree. Each student will be matched with an undergraduate and graduate student to work on a research project in a mentoring setting. Topic areas range according to the research focus of the graduate students participating in the program. High school women will work weekly on their research project 2-4 hours per week and will also be required to attend four Saturday Workshops with their cohort. This program is funded through a Women's Impact Network grant. Preference is given to young women in Worcester Public Schools who identify as women of color. 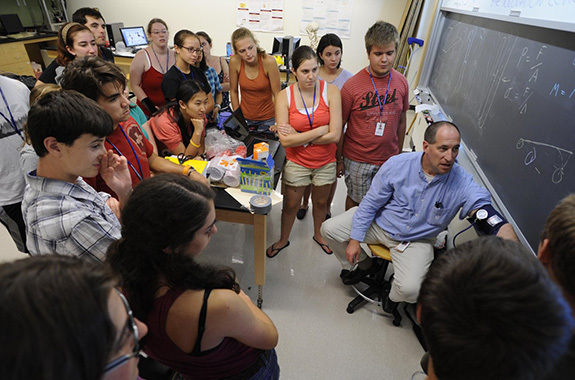 High school participants will receive a $250 participation stipend upon completion of the program and $500 towards an STEM summer program at WPI in 2020. (Students must complete all of the program meetings to be eligible for the stipend). For more information, please contact the Office of Pre-collegiate Outreach Programs by email at pop@wpi.edu or by phone at 508-831-4900. *Notes: A snack will be provided for each student for Saturday Workshops, but if you choose to bring your own, it must be nut free. Are you curious and creative? Do you like to work in teams to get things done while making your own decisions and setting your own course? Do you love math and science, but feel just as passionate about subjects such as music, art, or movies? WPI could be the right choice for your college decision.